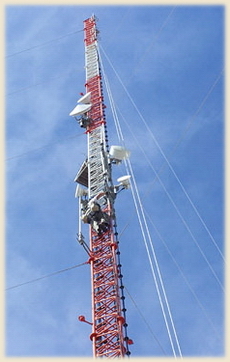 Guyed towers generally are designed in one of two ways. One is the Weld-Together design which can be installed in 20′ high sections and designed from 12″ to 72″ face widths. Weld- Together towers can be designed up to 1,200′ high. The second is the Bolt-Together design. This design can be installed in 20 or 30’ sections with face widths varying from 4’ to 12’. Bolt-Together towers are typically assembled on-site and can reach heights up to 2000’.